Hooking up a propane line might seem daunting to some homeowners. Fortunately, hooking up propane lines is just a matter of having the right tools. Propane fittings are attached using a simple flaring method, and with the flaring tool, almost anyone with basic do-it-yourself skills can run copper lines for use with propane. Flaring can be used to install virtually any kind of copper fitting -- so collect the necessary tools and go for it. Relieve any pressure in the existing propane lines, and disconnect them from the propane tank. Cut the old or new line where you want to install a fitting ("T" or valve). Slide an threaded fitting over the end of the line and flare the line with the flaring tool. Repeat as necessary for the other lines that join the fitting. Thread the fittings together and tighten them down with the crescent wrenches. Attach the lines to all necessary appliances and tighten them down. Bury the copper pipe lines at least 12 inches underground if you use them for an outside application. Bury the lines at least 18 inches underground if there is or may be vehicle traffic above them. 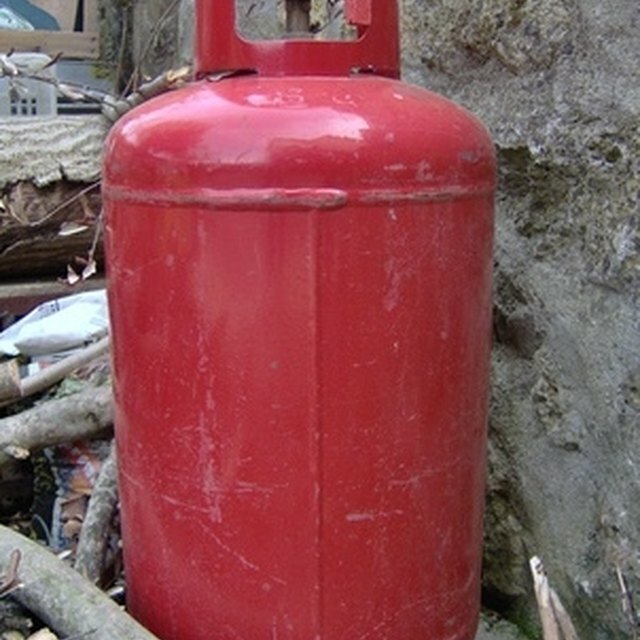 Attach the modified or new propane line to the tank, and turn on the gas. If you smell any leaks, turn off the gas at the tank, wait until you cannot smell gas any more, and repair the leak by installing a new fitting or tightening the existing fittings. Never work on copper lines that may be pressurized. Always turn off any gas at the propane tank and turn on a stove or other appliance until it burns out. Then disconnect the line at the tank to relieve any pressure and wait at least half an hour before working on the lines at any point. Never work on propane lines with any tool that produces an open flame unless you are working solely on a new line that has never been connected to any gas source and is not anywhere near a source of gas. Daniel Sutherland has been writing internal reports for his employers since 2005. He has extensive experience in automotive repair and do-it-yourself projects and writes on these topics for various websites. Sutherland received a Bachelor of Arts in philosophy and religion from College of the Ozarks in 2007. What Kind of Supply Piping for a Propane Furnace? How Do I Replace a Compressor in a Window AC Unit?